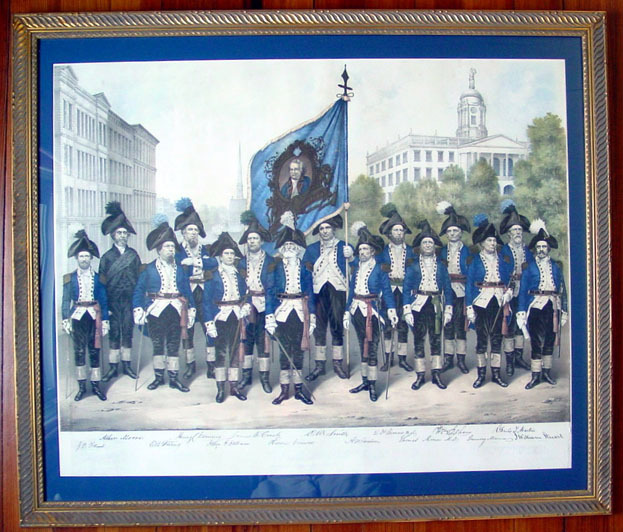 This is wonderful rare historic print of the famous Revolutionary War marching unit honoring General Israel Putnam that was formed in Hartford in 1858. 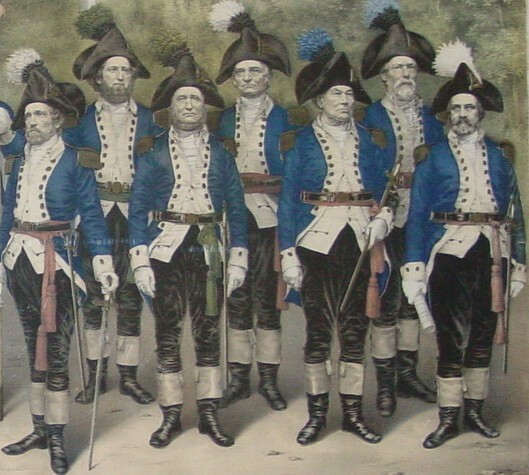 The men are clothed in the jaunty dark blue uniforms that are a replica of the uniform worn by Israel Putnam in the Revolutionary War, which made them a very popular marching group from their inception through the 20th century. Very few of these 1861 prints were made by the Bingham, Dodd & Co of Hartford and far fewer have survived, such that even historians in 1900 were not aware of their existence. The print shows that the leading men of Hartford in detailed portraits with the signatures underneath the print. They looks very serious about their civic duties and honoring the noble and courageous heritage of Connecticut arms. 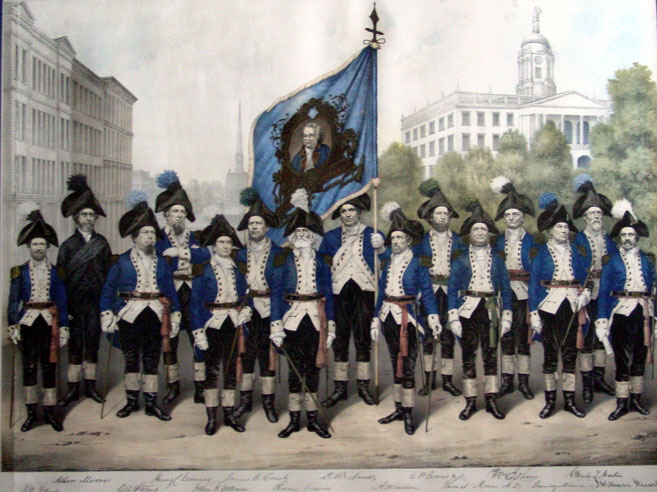 The print has a wonderful historic setting, the troops are standing in Hartford with the historic Old State House at their backs and their armory on Main Street and church steeple in the background. Below are a picture of the print as framed; some close-ups of the print, including the flag and some of the portraits; details of what is written on the print, including the names of the uniformed men; some history of the Putnam Phalanx, including an interesting incident on the eve of the Civil War; and an explanation of why we believe it is a very rare print. The title of print which is below the names of the men is "STAFF AND OFFICERS OF THE PUTNAM PHALANX AS ORIGINALLY CONSTITUTED"
Above the names of the officers and staff and below image area of the print it says “Entered according to Act of Congress in the year 1861 by Bingham, Dodd & Co in the Clerks Office in the District Court of the US for the District of Connecticut." 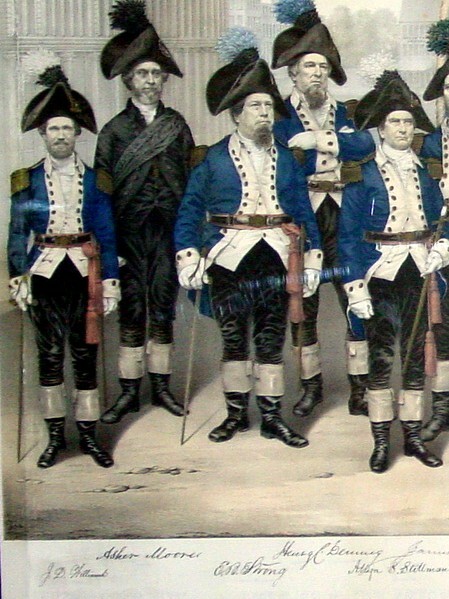 Below is the detail of the flag with a portrait of General Israel Putnam, the founding date of the Phalanx (August 13, 1858) and the portraits of Major Commandant Horace Goodwin and two other officers, Jarvis B. Crosby, Paymaster, to the left, and Otis Smith, Color Sgt., to the right. Jarvis B. Crosby, Paymaster Horace Goodwin, Major Commandant Otis Smith, Color Sgt. Above are the seven men on the right of the print directly below the Old State House. Their names and ranks are A M Gordon, Captain; D. T. Francis, M. D., Assist Surgeon; Thomas Miner M. D., Surgeon; Wm. T Shaw, Sgt. Major; Bruning Marcus, Commissary; Charles T. Martin, Quarter Mast. Sgt. and J. William Stuart, Judge Advocate. Stuart holding a paper in his hand was probably a lawyer and he gave the address in December 1860 in response to the speech by the Major or Baltimore that was so noticeably different in tone on the eve of the Civil War. The pictures above are of the five officers and staff of the Phalanx on the left of the print along with their signatures. The men and their ranks shown are J. D. Williams, Adjutant; Asher Moore, Chaplain; E. B. strong, Quarter Master; Henry C. Denning, Asst. Commissary; and Allyn S. Stillman, Captain. 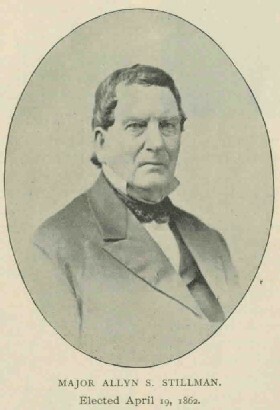 Stillman was the first Republican Mayor of Hartford and he served in that position from 4/11/1864 - 4/9/1866. Mayor Stillman is shown below a little older than in our print. In the print the Old State House looks different than it does today because it was painted white to look like marble during the renovation in 1827 which added the cupola on top. 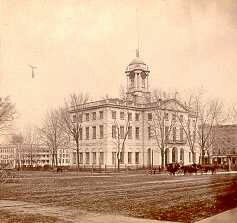 Below is a picture of the Old State House as it looked in the 1860s, which is consistent with the 1861 print. "its name, uniform and spirit so aroused associations of times historic, that it culminated in the organization of a command, the purpose of which was to commemorate and perpetuate the glorious past of Israel Putnam and other sons of the American Revolution." There is an interesting story about the Putnam Phalanx and a humorous speech my Mark Twain that involved the Phalanx. Shortly before this print was made the Phalanx went on a trip to Mount Vernon to view George Washington's tomb and stopped at a number of places where they were honored, including Baltimore and the White House. The time was December 1860, Abraham Lincoln had just been elected, the South was threatening to secede, and Baltimore had many Southern sympathizers. Indeed, less than six months later, after the Civil War had started, northern troops seeking to get to Washington in response to the call of Abraham Lincoln had to fight their way through Baltimore, and the Mayor was not helpful to the Union forces. So it is thus not surprising that the address of the Mayor and the address of the Phalanx, through its Judge Advocate and Captain, J. William Stuart, pictured above, differed considerably in tone and emphasis. You can read the account of the reception and speeches in the Baltimore American the next day on December 5 by clicking here. The speech Mark Twain gave was a toast he gave at a dinner in Hartford in 1877 for the Boston Ancient and Honorable Artillery company that was hosted by the Putnam Phalanx. Both Twain and the Phalanx were resident in Hartford during most of the 1870s and 1880s, so it was natural for the Phalanx to invite their famous resident writer and humorist to give a toast. The result, which recounts the unknown military of Twain, can be viewed here as it was reported in the New York Times. We believe the 1861 Putnam Phalanx print is a very rare print because, 1. we have not seen if before on the market despite looking long and hard (I have found the 1883 print twice while looking for the 1861 print); 2. it is not in the inventory of the major print dealers; 3. an internet search reveals no mention of the print; and 4. the Connecticut Historical Society does not have a copy. In any case it is a beautiful and historic print which looks good in our living room, and will look good in your office, library, den or living room.